Does Elevated Gastric pH Affect the Detection of Gastroesophageal Reflux Using 24 hr Esophageal pH monitoring? 24 hour esophageal pH is the most widely used method to quantify Gastroesophageal reflux (GER). GER may potentially be underestimated if the resting gastric pH is high. 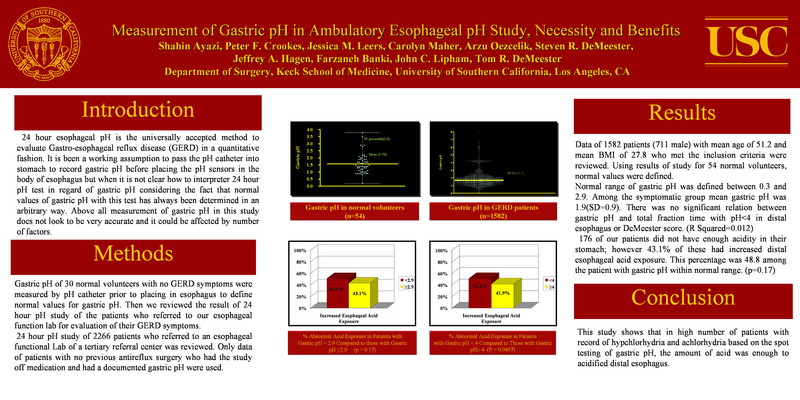 However, the value of routine assessment of gastric pH in the performance of 24hr esophageal pH monitoring is unclear. We studied normal subjects and symptomatic patients undergoing 24 hr pH monitoring to determine if there is a relationship between resting gastric pH and the presence of elevated esophageal acid exposure. Normal volunteers and symptomatic patients off medication and with no history of gastric or antireflux surgery were studied. In each case the gastric pH was measured by advancing the pH catheter into the stomach prior to positioning the electrode 5cm above the upper border of the lower esophageal sphincter. The normal range of gastric pH was defined from the normal subjects, and the patients were then stratified into two groups depending on whether the gastric pH was above or within the normal range. The standard parameters for 24 hr esophageal acid exposure were compared between groups to examine the possibility that reflux in patients with elevated resting gastric pH is predominantly due to meal-stimulated reflux. The Fisher exact test was used to assess significance.